A Children’s Play Area has been constructed in Harmer Hill, following a request received by the Parish Council from several local residents who have young children. The play area has been developed on a small area of land, which has been leased to the Council for many years for use as a recreation ground and it will be officially opened at 10.30am on Saturday April 21st. by Mrs Ginny Myall, who owns the land. Mrs. Myall readily agreed to extend the lease on the land to twenty years to enable the Council to seek grant aid for the purchase of appropriate play equipment, which was not possible using the limited budget held by the Council. Within a relatively short time a grant of £10,000 was offered by the National Lottery Fund and a further sum of £5,000 from a Shropshire based charity - the Hilton-Jones Trust. An additional grant has been promised by Tesco and with a little top-up from the Community Infrastructure Levy, it has been possible to construct this state of the art play area at no cost to the local community rate payers. Advice and quotations were sought from various sources and Ray Parry Playground Services Ltd., a Shrewsbury Company with a national reputation, was selected to carry out the work. Ray has carried out work before for the Council and undertaken many projects in the County and further afield. The dreadful weather over the past few months delayed the start of work but we are pleased to report that it was completed just as the Easter school holidays began. It is hoped that it will be well used and we welcome residents to attend the official opening. The Chairman outlined the reasons for requesting the meeting, pointing out that the Council felt that there should be a more formal approach to the issue of road safety concerns. Many reports had been made but it appeared that very few had been resolved and a meeting of this nature would help to clarify the situation and enable the Parish Council to keep residents better informed. Mr. Gradwell stated that he was happy to meet up with council representatives discuss safety issues which had been made and help where possible. 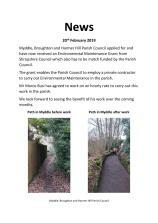 He then outlined his responsibilities, which were for the whole of north Shropshire and said that he received many requests from Parish Councils throughout the area at the identified times. He had to record, prioritise and cost these requests and make an assessment based on real need. These assessments were then forwarded to the Transport Planning Department, who considered them alongside reports received from the other areas of the County and eventually prepared a list for inclusion in the programme for the next financial year. Unfortunately Government money for this type of work had been severely reduced and further cuts were in the pipeline for the next few years, which resulted in most of the requests either being delayed or turned down. This had been identified by the Council as its highest priority, with many children having to cross a busy road to access the school, where traffic speed was frequently excessive and it was felt that there was a need for traffic calming measures. A traffic survey had been carried out on the Myddle to Baschurch Road which had shown that the 85th percentile recorded was 35mph. Mr. Gradwell agreed that it was a high priority and pointed out that certain measures had already been undertaken – the erection of a VAR sign; the construction of a roundabout and extensions to the 30mph limit. However he agreed that there was still a priority issue by the school and he had put this forward but had been unable to secure funding this year to even carry out a speed survey in the vicinity of the school. He had estimated that the cost of a speed survey would be £600 and any effective speed calming measures in the region of £30,000. It was agreed that the realistic way to control the speed of vehicles would be to place ‘cushions’ in the road although these were unpopular with many road users. Mr. Gradwell agreed that it could speed up any action if the Parish could use CIL money for all or part of the project and he agreed to propose a realistic estimate of the costs of the project. Council would then be in a position to consider, see how much CIL money was available and consult with residents about the proposed system of control. Mr. Gradwell agreed to write to the parish council outlining the problems, proposing the potential solutions and giving an approximate cost of the solutions proposed. It was agreed that extensive work had been carried out at the accident black spot near Myddlewood and that no further action could be taken. An order had been placed with Ringway for the erection of ‘Unsuitable for HGV’ signs. Mr. Gradwell will push for completion of the order. A prohibition sign could be used but it would require a special order, take much longer to get agreement and cost considerably more. Mr. Gradwell agreed to arrange for ‘SLOW’ signage to be put in place. It was agreed that that section of the road was not suitable for road calming measures. An order had been placed with Ringway for the erection of a ‘PEDESTRIANS CROSSING’ sign to be erected. (i)Mr. Gradwell agreed to get the verge stones removed by the team headed up by Mr. Fisher (Highways area Engineer). Request had been recorded but would require a ‘Road Transport Order’ for the change and unlikely to secure funding. It was noted that the Safer Road Partnership were continuing to carry out checks and had forwarded some useful data but there was a need to check if their actions were having any effect on the overall speed of traffic. Clerk to make further contact with Mr. Connolly at the Safer Road Partnership. Agreed that the Highways maintenance team should see if improvements could be made – any extensive work would be very costly. It was agreed that the improvements carried out had greatly improved the junction. It was agreed to meet again on June 8th. at 10.00am to review developments. The Chairman thanked Mr. Gradwell for attending and stated that he felt that the meeting had been worthwhile and had clarified a number of issues.